If you own a Tecsun PL-360, PL-365 or a CountyComm GP5/DSP or GP5/SSB, you might take note of this large ferrite bar antenna offered by a Greece-based seller on eBay. As you can see in the image above, this antenna is substantially larger than the stock MW antenna supplied by the manufacturer. According to the seller, this ferrite bar antenna has a 10 – 25 db gain over the stock external antenna. I imagine its ability to null unwanted signals is also much better. The price is about $40 US shipped internationally. Have any SWLing Post readers ordered this antenna? If so, please share your comments/reviews. Click here to view the antenna on eBay. Many thanks to SWLing Post readers, Francis Frankenne and David Korchin for the tip! This entry was posted in Accessories, AM, Mediumwave, New Products, News, Radio Modifications, Radios and tagged CountyComm, CountyComm GP5-SSB, CountyComm GP5/DSP, ferrite antennas, GP5/SSB, PL-360, PL-365, Tecsun, Tecsun PL-365 on January 6, 2016 by Thomas. 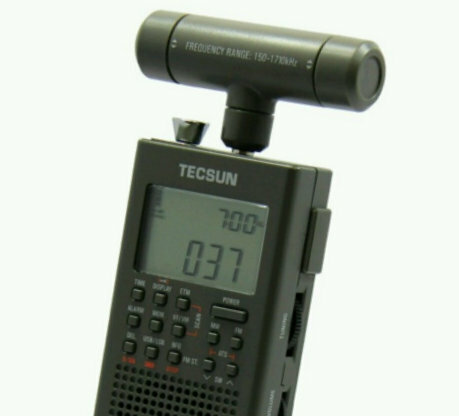 Being new to shortwave listening, I purchased the Tecsun PL-360 to take with me on vacation due to it’s ease of portability. The High Sensitivity AM Antenna is a great help, however, the manual is completely silent on how to use it other than”plug it in”. Figured that much out. I noticed that on each endcap there are up and down arrows indicating that these caps can be turned independently. Can anyone give me any guidance on how to use them? the end caps are used to hold the whole “T”-Ferrite antenna together. You can rotate the end caps in arrow direction, pull them off and dissasemble the whole thing. The antenna contains a coil, made of hf litz wire on a small ferrite bar. There are no tuning elements leading to the end caps of the antenna. You will only have to plug in the antenna. The rx uses a SiLabs receiver chip which is capable to tune in the antenna in a wide frequency range. Thanks very much Chris. Makes me wonder why Tecsun put those arrows there in the first place if they were of no significance to the user. Especially me, being a novice…it was confusing. Thanks very much for your response! Nothing to adjust, these are only plastic end caps. Thanks Theo. You folks have helped a novice get a better understanding where the manufacturer failed. Appreciate it! Has anyone been victim to the connector going bad? I have and I would really appreciate a schematic or drawing on how to repair this antenna connector. As you know when you plug in the external antenna it bypasses the other antenna circuit and when you pull it out, the normal antenna takes over. My PL-360 ( and I have 2 of them with this problem) does not engage the inner circuit so I am left with nothing to listen to—the external antenna also does not make the correct connection so nothing again. I have opened up the radios and I cannot make out how to repair this connector without unsoldering it and that would be a disaster I think so is there a mechanical method to restore the function of that connector or even just force it one way or the other would be acceptable at this point. Concerning high efficient loopstick reception antennas take a look here https://www.youtube.com/watch?v=UfUjTTKCY3c (and also parts 2& 3). These videos are long-time but informative. And the major advantage is that this antenna is tunable for each frequency giving thus maximum results. 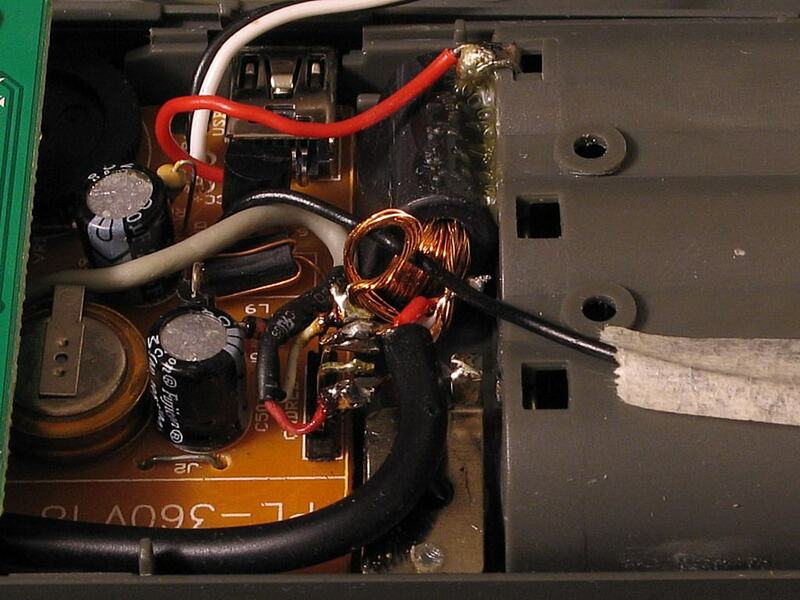 Does anyone know why the end caps of the original AM/LW antenna supplied with the radio have arrows on them, and why they rotate and “click” into position? Is one position for LW or AM and turning them change the band! There is no internal connection between the antenna’s end caps and the coils or ferrite inside. They are simply to protect the ferrite and to keep dust out. I’m sure the markings are an aid in manufacturing for the assembly technicians. When I modified this plug-in antenna for my own GP-5, the housing pieces came apart easily after rotating and removing the end caps. It’s really a nice, simple plug-in design that begs for hot rodding! BTW, Gary DeBock, my cross town DXing pal and Ultralights radio guru, published a nice mods article for the Tecsun PL-360 a few years ago. 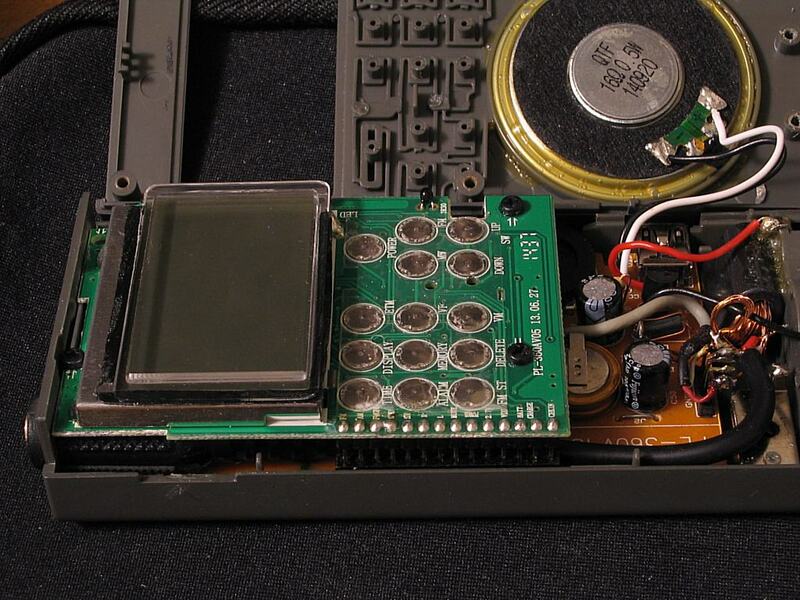 He came up with his own method to adapt a larger plug-in antenna to this Tecsun (non-SSB version of the GP-5/SSB). That standard plug-in antenna reminded me of something, but for a long time I could not think of what it was until I had cause to explore a small CF card recorder for mobile high quality recordings. I looked at various things, and some of them had plug-in microphones. I did not see one that used this exact form, but a cheap and simple method might be made from that same casing with a 10 mm electret mic capsule in each end. The end caps would need a small hole or two in them, but no other detail need be changed, so it’s possible that this was the original purpose of the design, and the antenna adaptation came later, as a way to use up some surplus parts. This would save Tecsun a lot of money, compared to designing and making specialised parts themselves for an as yet untested design that they may have been unable to sell. Thanks Thomas, for hosting pictures. As my main aim was for the AM bands, I’ll try to reduce my text as much as I can, this is a SW blog.. Even so, I’ll make this a top level reply to ease reading and scrolling, if I leave out too much the details that make this inductor possible to wind will be left out, making it too difficult to try it. This is the coil, covering all of MW and some of LW. It’s aimed at NDB hunting, which is easier with SSB than it is with a narrowband AM filter. Ham bands with Morse in this range make it more useful. Ignore the multiple input taps, using all ten turns gives the best result. 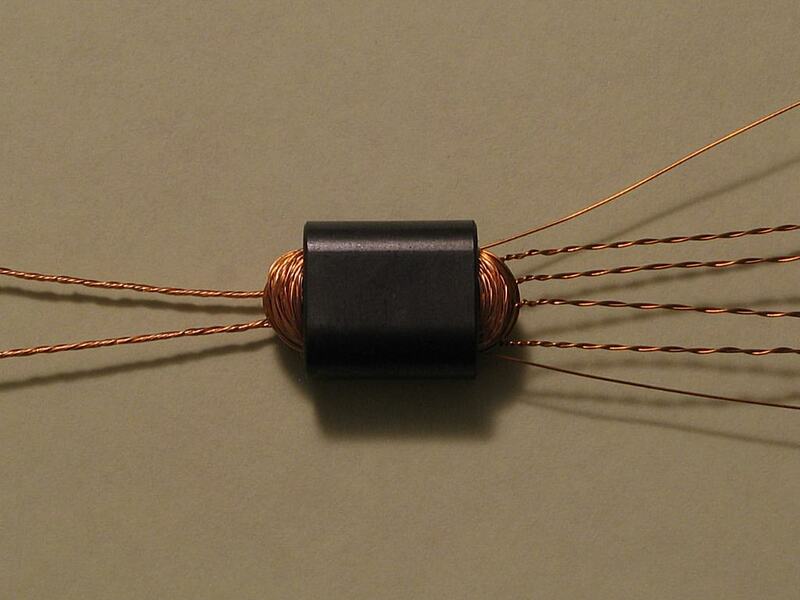 The main coil has 36 turns on a BN-51-202 two-hole ferrite core, for about 570 µH. This shows my modification of a PL-365. 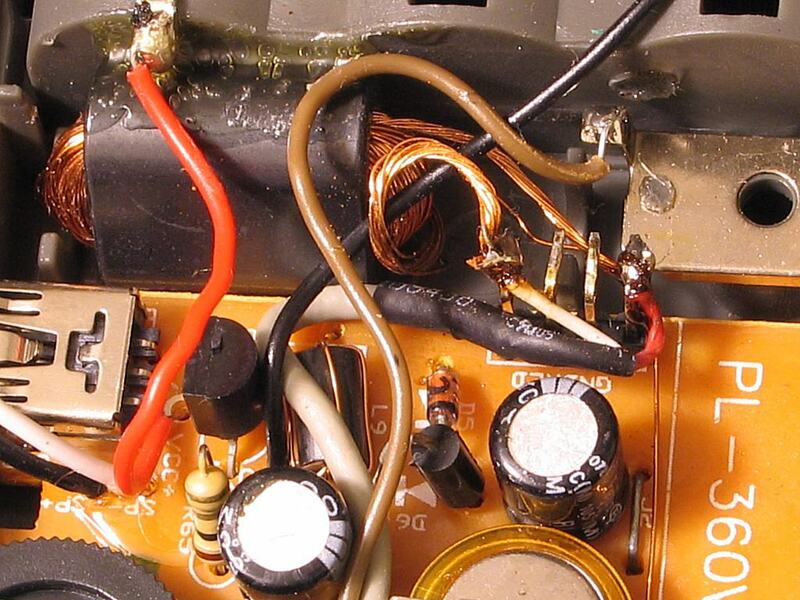 The coil can be external, but keep wiring short to minimise stray capacitance if you want all of MW. 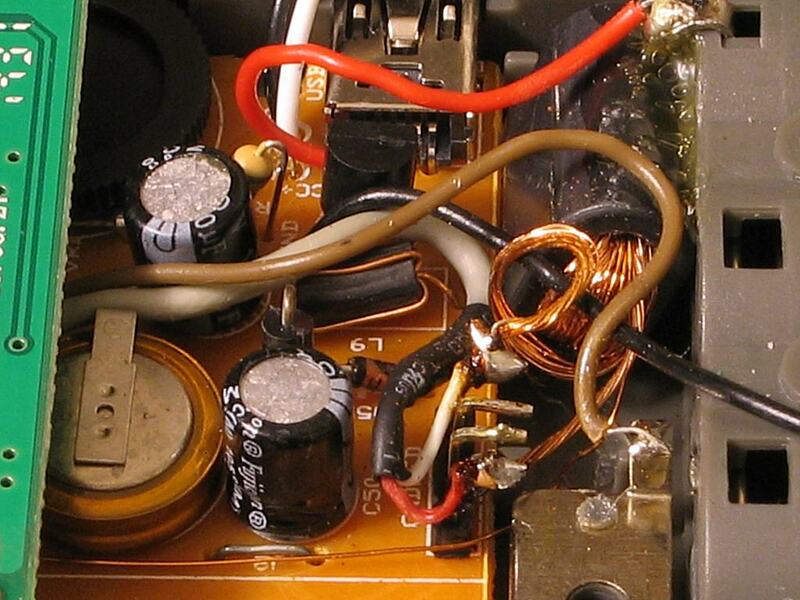 The inductance is higher than standard to get the lowest extension into LW. The Si4743 IC datasheet states a limited inductance, but much more is needed for full LW coverage. After a few tests (and many helpful emails from Steve Ratzlaff about Q factor), this coil was the most useful and least complex system to make. I replaced the tiny existing rod antenna, with main and coupling coil sharing a common ground on the white wire’s solder tag, the main output goes to the red wire, and the input to the coupling comes from a long wire antenna, or a loop (which I haven’t tried). Same as above, but it may clarify things not easy to see in that one. Apart from that new inductor replacing the tiny rod, all other parts and wires are original. This allows easy external input from a remote antenna, and also removes a pickup of ambient RF noise in the AM band. Plugging in an external rod bypasses the internal inductor so this modification allows normal use of the external input. This shows one way to get the signal in. As I removed the internal whip in this radio (to improve VHF FM pickup on the RF input socket for strong hi-fi stations in Britain), I had space to add another socket made from a 3.5mm headphone extension cable. In this case the tip and ring lines are connected together, for the input to the coupling coil. This tries to clarify the previous one, not very well… What matters is that the four tags for the inductor connections are as two pairs, so the inner one for the ground side can be used for the input cable’s screen. The other is not used because that’s the inductor’s output line, the input line is soldered directly to the input wire on the inductor. This inductor needs a high Q factor to get best selectivity and sensitivity. It’s too small for litz wire, so a special winding method is used. I array some very thin solderable enamelled copper wire back and forth between supports gently but with no slack, with enough span to meet the length of winding needed (about 7 feet for 36 turns with 3 inches for each end). I bind the ends with a tight wrap of spare wire, maintaining the parallel array with no crossings or twists, then stretch the bunched strands to about 1 to 2 percent extra length. The enamel withstands more than this so it’s safe, and it makes the wire ‘forget’ all memory of previous twists or bends. I then put superglue along 1cm or so at one end, and at least 5cm at the other to form a needle to thread the core. When cured, I cut it free while holding it taut as I lower it to the floor. I pick up both ends so a bight forms and hangs evenly without twisting in front of me, and raise one end while lowering the other, rolling this bight back and forth along the wire strands. The resulting gentle bend allows me to lay it down on its side knowing it won’t twist. This way it is possible to avoid any twist ever occurring. At least, it may happen as the wire passes round the end of a core, but not in the aperture, which is the important thing to avoid. Even then, a limit of 50% of available aperture area should be filled with copper. Any more, and it gets hard to add a coupling coil afterwards. To get the firmest lay of turns I use a teflon coated wire as a fid to poke open a free threading hole while displacing the existing turns into best place with a gentle even pressure. The result is as good as it is likely possible to get. No perfect tessellation is possible, and actual tessellation is highly dependent on ratio of wire to aperture diameter, so I take pot luck there… 50% copper fill seems to be a consistent rule no matter what I do to minimise the wasted space between each turn and strand. I managed 36 turns of 9×0.15mm wire on one BN-61-202 core to get 579.8 µH. Al=447. I’d also done it with 3×0.25mm which was easy. Q was slightly higher with 9×0.15mm but by so little that it is clearly diminishing returns to fight for larger numbers of finer strands. An upper limit of 16 strands of 0.08mm wire is feasible, but I haven’t tried it. It may only raise Q by a small fraction if I did. If this inspires anyone to experiment, here’s the most important advice I can give: Litz is fragile and expensive, likely impossible to put on a cheap small ferrite core! Even if you can, you waste space with insulation material and won’t get enough turns on it. Instead, raise Q by reducing total wire length (hence the small core), and use as many turns as possible of fine parallel strands in a single core to gain advantage from the ‘square law’ relation between inductance and turns count, and fill the aperture to make best use of the ferrite’s Al value. Could someone please post photos of their ferrite rod experiments so we can try ours.Many thanks!! I have some photos of my work but can’t post them here, and I have no hosting for them. If Thomas (blog owner) wants to host them, I’ll send him some. Just send them to my email address and I’ll make it so they can be seen! When I bought a GP-5/SSB a few months ago I made a large plug-in ferrite rod antenna for it. The popular 10mm X 200mm size sold by Russian Ebay sellers works very well as a rod. You only need to have the inductance within the range of 180 to 450 uH, as the SiLabs chips in these receivers automatically peak the antenna whenever you tune to a new frequency. I ordered an extra plug-in ferrite antenna from Anon-Co’s web site to use as a basis for this experimentation. The mechanical fitting of the longer rod is fairly easy, as the stock antenna has screw-off caps. You only need to drill out the caps for the ferrite to extend outwards. Depending on the size of the Litz wire you use for the new coil (larger diameter Litz is better; see the Ultralight Radios Yahoo Group), you may need to do some further modification. Perhaps the most “fiddly” part of the mod is soldering the new, larger Litz to the 3.5mm plug that goes to the antenna input of the radio. Performance of the new ferrite antenna is excellent; I found 25-30 dB gain over the stock antenna by using higher quality, larger Litz wire. I think the Ebay seller from Greece probably unwinds and reuses the stock Litz wire from the original antenna; this wire is rather small diameter. This is true if you want MW coverage, but to get it to extend to LW it only goes partway down, and to maximise that you need to set inductance as large as 560, maybe 570 µH, and then minimise stray capacitance in wiring to the RF socket to maintain full cover at the top of MW. Making a tapped coil with a switch might help, and is likely required if you want proper resonance on all of both bands. One cheap way to improve the external rod is to get the standard spare antenna that is universally sold worldwide, probably intended as a spare. It’s a 9 mm thick, slightly flattened 125 mm length of type 61 ferrite, made in China, and has two unglued coils, for MW and LW on it. Keep the one you want and ignore the other unless you can make both fit when using the original external stick mounting. Performance will not be as good as the larger 40 dollar rod, but the bang per buck will still be nice. Note: I once broke a PL-390’s internal rod during some dodgy experiment, and replaced it with one of these standard spares I described above. The result is slightlly better than the original! Not bad for something that cost me 3 quid and included a neatly wound coil on it too. For the record, it is likely 15 strands of 0.08 mm wire, same as is used in the PL-390. (Translate to AWG as required.) I have done some experiments that suggest that this is actually a good choice. Using more strands, but thinner, makes little difference for most of MW and likely none for LW. If you’re concerned with the ‘Q factor’ to get best selectivity, aim for maximising turns count while minimising total wire length. That way you get gains from the ‘square law’ related to turns count, enough to overcome losses elsewhere. This will be far more important than strand thickness. I would like to to thank Thomas for this post. how is the antenna mechanically made? I can see a longer rod peeking out on both sides of the standard antenna case. How is the ferrite rod secured? Is there a tube around to make it safe against breaking? I fear breaking it on a fieldday or during transport. So… should be always handle with care as ferrites are pretty much like glass! While the RF socket isn’t physically strong, a small extra load is worth the risk if it protects an external rod, and one way might be to use a T coupling for 20mm PVC electrical conduit, with the plug fitted to a cap on the stem of the T, and the opposing ends fitted with capped lengths of 20mm conduit. Anchor the ends in closed-cell polyethylene foam, inside the capped ends. Do not anchor the rest of the rod, that way a slight bend on the case will not be passed to the rod, so won’t break it easily. A better way might be to modify the belt clip to support a rod mounted in a single length of 20mm plastic conduit, then a (very) short cable can go from a hole in its midpoint to the RF input. This won’t allow rotation without rotating the whole radio to null a signal, but it will protect the input socket from stress. Does anyone know if experiments have been done with shatterproof tubes filled with ferrite powder? I tried using Google to search but the SNR for my few search tests was so bad that I didn’t want to trawl through them. Is there some reason why ferrites must be in solid brittle form to work? I know that some magnets, like those that seal fridge doors, are powders embedded in a flexible medium. I’m wondering if radio ferrites can work the same way. If you have spare ferrite rods/bars in your work shop,it’s worth while experimenting with different number of windings and correct wire .I have tried this with light transformer wire on a fairly long rod but no effect when connected to a radio,But perhapes I should have another try after viewing this one commercialy made.Most of our portable radios have the outside antenna input on the side of the radios,So a short lenght of coaxal cable from the rod to the radio would be required I guess.Very interesting !! Interesting – I have wondered how useful the original antenna might be in other portables with an antenna input jack, but have not tested it yet. This might be a better test in that the size is so much larger – could really help some of the portables with rather small internal ferrite bars. In general, size matters with ferrite bars, the larger the size the greater the sensitivity, all things being equal. But of course, it depends on the coil windings, etc. Another interesting test miight be inductance coupling with the antenna just next to the radio wherever the internal ferrite bar is located. Just food for thought! However, my 2 TECSUN 360’s have failed to make connections to the external or the internal antenna circuits. I have looked inside and I cannot determine how to repair the multi plug where the external comes into. Both radios are as if no antenna is connected. Inserting the external does nothing. I am former wide format color printer and other product onsite technician so all I need is a good picture or a good schematic so I can tear open that connector and hopefully replace it or repair it. ANY SCHEMATIC on the tecsun 360 antenna sections specifically the connector that disconnects the inside antenna. Mine is unconnected.So the radio is a light weight brick.